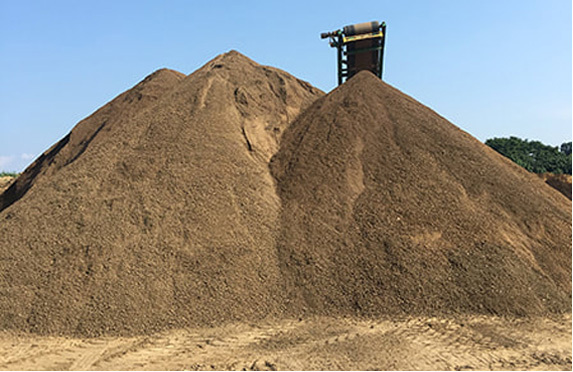 Screened topsoil – We screen our own topsoil off-site with a 1/2” minus screen producing high-quality topsoil. Super Soil – This is a 50/50 blend of mushroom soil and topsoil. This is excellent for growing grass. Unscreened Fill Dirt – This is useful to fill big holes, but is not recommended for any other soil use. Mushroom Soil – This weighs about 1100 pounds dry. This is good to till into your garden as fertilizer. Q: How do I seed my lawn? A: If spotty, rake spots to loosen soil. Seed generously. Top with super soil or gardener’s compost. Cover the seeded areas with straw. Water the area enough to moisten area, but do not over saturate the area. If it is the whole lawn, rake to loosen soil. Seed generously. Roll with water filled or solid seed roller to cause seed to contact dirt. Cover the area with straw. Water enough to moisten, but do not over saturate. Q: How much does screened topsoil weigh? A: One yard weighs 1200-1300 pounds when dry. Q: How much topsoil will my truck hold? A: A typical 8-foot bed will hold one yard if dry. A typical six-foot bed will hold ½ yard if dry. Not sure how much mulch or dirt you need? Use our calculator to help you estimate how much product you'll need. Click here for details.